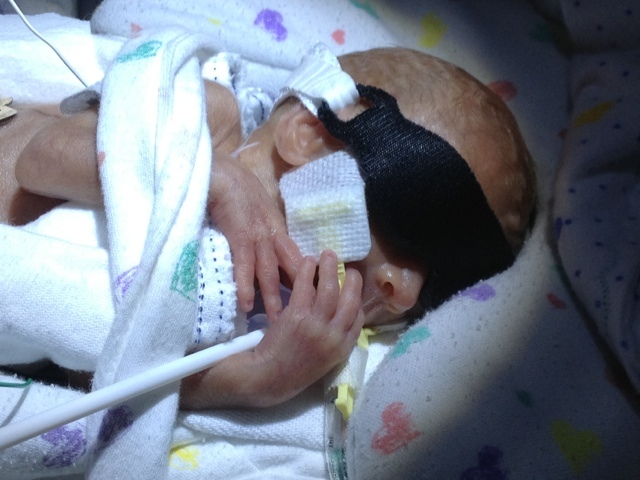 Briella went back on light therapy today. I love her sunglasses so thats ok with me. She also finally started gaining weight today! Yay!!! She was 590 grams yesterday & 610 today! She had her first feeding at lunch today. Mommy was VERY happy & excited about this. I'm ready for her to start growing. She did so well & digested everything and tolerated it perfectly that they gave her dinner too! She had a blood transfusion this morning and it didn't phase her a bit. Her blood gasses are giving her a little trouble, too much alkaline? So we had to suspend the feedings until those numbers look better. But she is looking great with all of her respiratory numbers. The Dr this morning said she was proud of our little girl for doing so well. The Dr, all her nurses and myself believe that Briella is actually 5 or 6 days older than what she is. 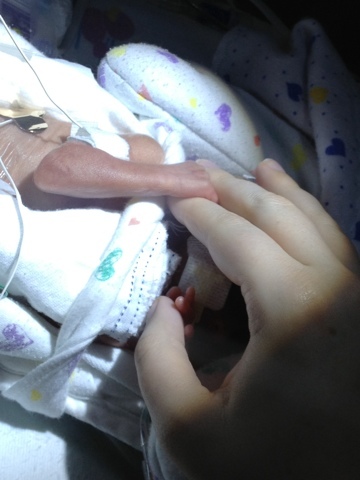 Every one of her care takers have said that her skin is in the best shape for a baby born right before 24 weeks. She isn't having near the problems that a 23 Weeker has. As you know from previous blogs, Briella has consistently measured 5-6 days ahead since her first sonogram. However my OB would not change the due date unless it was more than a 10 day change. That would've been fine with me except that when things took a turn for the worst when I was still pregnant, the dr was going to let her pass in our arms just because she wasn't to a certain day yet. Which turns out she actually was. It makes me angry on so many levels. I believe we should've been using the due date the sonogram showed. I am thankful that we pushed to transfer somewhere that would help us. And I am thankful my OB helped us very quickly find a dr that would help. We were told today to prepare for the next 72 hours as there will most likely be lots of constant changes & tweaks to her care. She is showing signs of coming off the "honeymoon" stage. I'm trying very hard not to let it tear me apart. But it's so hard to start to see alarms that have never gone off. Tonight, twice she "desat". 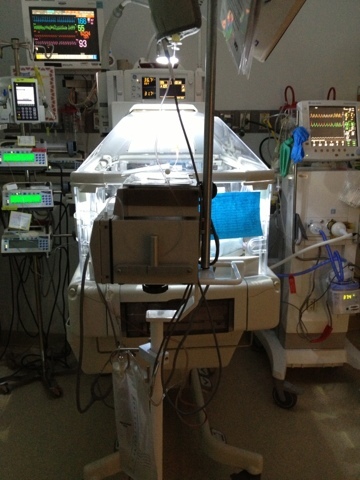 That means one of the numbers they monitor dropped too low & they had to give her oxygen. She has been doing amazing with room air. I am still so proud of her & keep telling her that. I tell her she just has to fight through the tiredness and stay feisty. Tonight she was just moving around a lot and couldn't get comfortable. So I put my hands over her holding her arms and legs firmly. She loves firm holds and doesn't like light touches. The nurse said she was told she had to ask the story of her birth and her name. So I told the story while holding her. The next thing we knew it was an hour later an Miss Briella was having the best numbers of the night and was so peaceful. She just loved hearing the story of herself being born like a rock star as the doctor said. I probably held her for 3 hours straight tonight. Daddy wasn't feeling great today so he couldn't see lil missy. He was sad so Briella surprised daddy & sissy with a Skype session. Briella flailed her arm and Aubrey thought she was waiving so started waiving really big back. It was too cute. 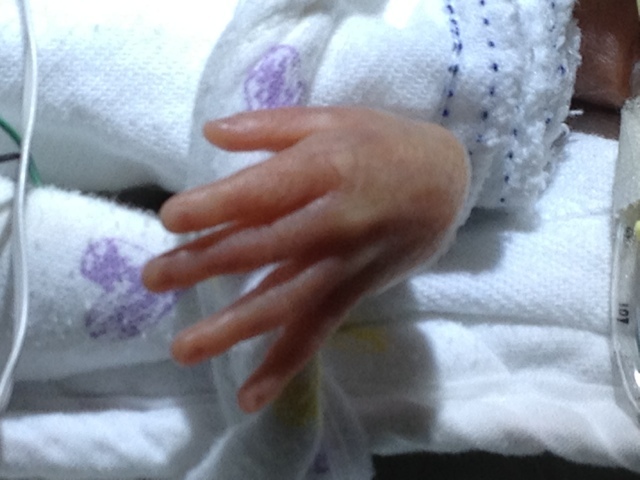 I took my hands off her and out of the incubator and told Brie that I had to go to sleep. I then stood around for a moment to watch her and she would start being restless again. So maybe 3 times I kept going back in to calm her down then walk away. Finally I decided to tell her stories until she was asleep and I could sneak out. I told her how her big sissy saves all her money for a trip to France. I told her how first I think we should go to Disney then a beach in Florida. I told her how her grandma & grandpa have a condo in the Bahamas and how Daddy likes to go there. I told her he will make us a big sand castle an we will pick up seashells. I promised her I would let her pick out any color she wants for her room, even if it is pink. I promised I would fight Daddy for her (he said no pink.) I told her all about her cousins that were coming to visit in a week. I have fallen in love with being able to sneak up there again before bed and hang with her for awhile then. It has become my favorite time with her. The nurses usually give us a little more privacy at night so I can talk to her all I want. Tomorrow I have to leave the hospital and I have no idea how I am going to handle it. I don't want to go home. I want to stay with her. I will only be able to be with her during school hours the majority of the time now, while Brian will do the evening visits. I am grateful for the extra time the hospital let me stay but I am already panicking about not being able to run upstairs and check on her after each blood gas check or running her milk up to her every 3 hours. I know Aubrey is really needing to get back to her normal routine and I am excited to be able to snuggle with her again. But my heart will not be complete until we can bring Briella home. I am so praying that she will be home for Christmas. The last pic is of her holding in her binkie on her own. I also posted one of what her room looks like with all the equipment.